When I tell people that I am part of the One-Pot Blogger Cooking Party and that I have been cooking Emeril recipes for two straight weeks I see this strange look come across their face...and then I get "So you're cooking WITH Emeril?" As much as I wish Emeril and I were standing side by side in the kitchen, chopping veggies and browning meat, that's not the case. What I am doing though is cooking from Emeril's soon to be released book Sizzling Skillets and Other One-Pot Wonders and sharing my experiences. The next question I get is "Are you having fun with that?" Hell yes! I'm having lots of fun with this. I get a sneak peak at a new cookbook, I get to cook yummy Emeril recipes almost every night, and I get to be part of a cool blogger group...what's not to like? This is usually followed by "Aren't you bored cooking just from one cookbook?" Not yet, Emeril's new book has such a nice variety of recipes. And I love that a lot are what I call "week-night" friendly. Like last night's Linguini with Artichokes Shrimp and Mascarpone. This restaurant style meal came together literally in the time it took to cook the pasta...less than 15 minutes. I left the shrimp out (remember I'm allergic) and I added slightly less mascarpone and slightly more lemon rind...just personal preference. I "kicked it up a notch" with some crushed red pepper sprinkled on top and had a yummy pasta dinner for my hubby and I ready in no time. Unfortunately, this is not one of the recipes I can share with you....bummer I know. But you can get this recipe and over 100 others in Emeril's new book. (preorder it here). If you want to find out more about Emeril you can follow him on twitter or like him on facebook. What a great recipe! I'm so glad you are doing this! Great post! I'm enjoying cooking with you!! :) This has been a really fun experience. Lovely, really enjoying everyone's posts! I like your idea to add crushed red pepper--yum! 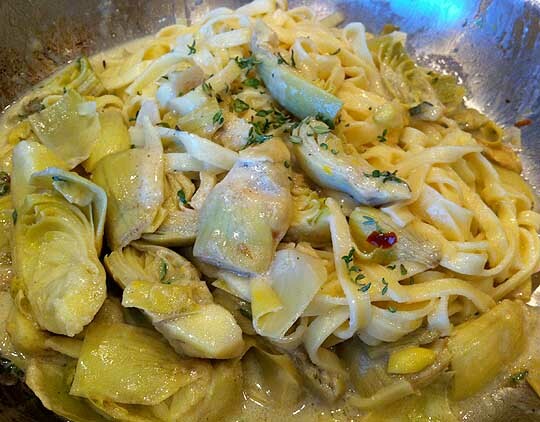 I love artichokes, and this looks really great. Too bad you can't have shrimp, but I'd bet it would work with chicken as well. 1st time I've seen this Blog but I LOOOVVEEE Emeril so how do I get this recipe? I skipped lunch today ~ how I WISH I had a plate of this goodness before me right now. :) Looks delicious!! Love the looks of this one. Are they fresh artichokes? Can't wait for this recipe. How could you get bored with these kinds of recipes. It looks fantastic, but with the shrimp it must be even better.